First of all, I do want to thank the several readers who pointed out an error in last week’s column about lucky bamboo. It seems that I left a “Y” off an important word. It read “luck bamboo,” not “lucky bamboo.” I guess I should be paying more attention to my spell checker. But it does point out the fact that the column is being read. I do want to say that researching for last week’s column and this one has been a fascinating journey. I learned a lot about plants, culture — especially Chinese — and myths. I think that is why I so enjoy writing. It is, every week, a learning experience. To begin with lucky bamboo is just one of the names attached to the plant. Depending on what part of the world you are in, it might be called curly bamboo, Chinese water bamboo, friendship bamboo, goddess of mercy plant and ribbon plant. Actually, this confusion really points up the need for our systems of botanical (Latin) plant names. No matter where in the world you might be, the plant will be easily identified as Dracena sanderiana. To begin with, lucky bamboo plays an important role in feng shui, a strong belief in life and surroundings in Chinese culture. It is believed that the presence of this plant in a home or office or other surroundings will bring positive energy. Known as “fu gwey zhu” to the Chinese, the plant translates to “fu” for luck and good fortune, “gwey” for power and honor and “zhu” for bamboo. But bringing luck is just part of the story. While a single stem or stalk generally brings luck, there is a whole culture based upon the number of stems that are planted in a dish or tied together. There are even more meanings depending on the twisted shapes and configurations. But here, I just want to talk about the meanings denoted by the number of stems in the bundle. Much of the following is derived from several articles I researched on the internet this past weekend. Let’s start with a planting of two stems. This one is easy: It doubles the luck factor. Two bamboo stalks are supposed to bring an abundance of love and affection. A frequent gift, it is sent to express love and affection. Three stems are an even more frequent gift. This combination is supposed to bring happiness, long life and success in one’s career with many promotions. Four stems is an unwelcome gift. The Chinese symbol for four is very near that which signifies death. You would never see a planting of four stalks in Chinese culture. And to give one would be interpreted as a giving a death wish. A grouping of five stems attracts a lot of positive energy and influences five important areas of one’s life that can bring good health and wealth: emotional, intuitive, mental, physical and spiritual. Six in the Chinese language sounds a lot like the word for luck. This grouping is supposed to bring in opportunities to increase your wealth. Seven stems tied together will certainly mean good health. 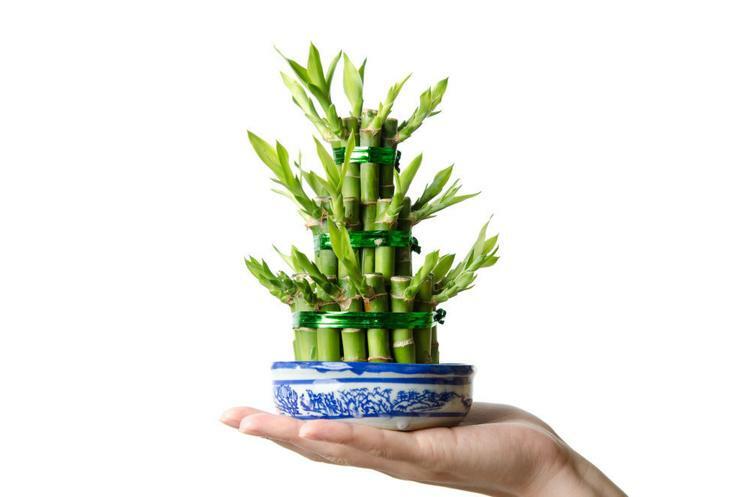 Eight bamboo stems are often sent to young couples because this grouping brings positive energy to increase fertility. Nine stems bestows great luck on the receiver. Ten stems denotes all the good things in life. Gifting 10 stems shows that you want the person to have a perfect and happy life. And then we come to 21 stems. If someone should gift you this number, you should assume that they have great wealth because of the cost of such a gift, but you and your family are being delivered a very powerful blessing for great wealth and enduring health. So, have I enthused you so much that you want to go right out and get a lucky bamboo? They are available right here in Auburn. I assume that Home Depot and Dickman Farms carries them. And last week, I saw a large display of them at Lowe’s. Whether or not you have a lucky bamboo, I wish you wealth, health and happiness. This entry was posted in Flowers, Garden, Plants and tagged Auburn NY, Cosentino Florist, Garden, horticultural, Plants. Bookmark the permalink.